Florence + The Machine = Misinformers on Race and Violence ? Some of my regular sites have been in an uproar recently about Florence + The Machine’s video for the song off their recent album, Ceremonials. I found the video lacking racial sensitivity and recycling tired primitivist tropes. The video, unfortunately, is not the band’s first demonstration of poor judgment. In an interview with NPR’s Melissa Block, Welch explains she wrote the song at age 17 in an attempt to fit in with garage-rocker peers. She claims the lyrics are purely figurative, “a metaphor for first love, in all its intensities,” but she did not acknowledge the provocation in the message. Singing about black eyes and partner violence without consequence or reflection shows a profound lack of sensitivity. “Kiss with a Fist” normalizes domestic violence, making it harder for victims of abuse to be taken seriously. Domestic violence does not equate emotionally or psychologically to the pangs of first love. The song fails to make that distinction. Let’s return to the more current issue at hand, racism in Welch’s newest video. In the same interview with Melissa Block, Welch expands on her musical philosophy, providing some insight into the primitivist elements in the video. The music is a “primal and tribal bashing of percussion, mixed with the choral side of the backing vocals,” Welch explained in April of 2010. Ceremonials was released in October of 2011, though the juxtaposition of “tribal” and “choral” elements feature prominently in the “No Light, No Light,” video. 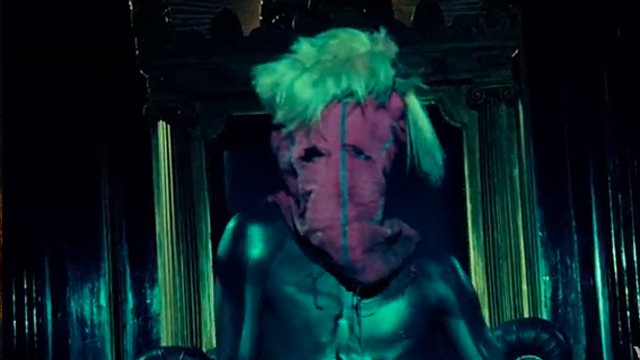 The video grossly misrepresents race and tribalism, creating a pseudo-ritual with a voodoo doll, mask, and dancing evocative of possession rituals. The producers of the video take it a step further with a scene of the black man chasing Welch, a white woman down an alley. The racial, primitive character does not represent any actual culture or race. He stands vilified and wild next to the purity of an all-boys church choir and Welch herself. Blogs through Jezebel and Racialicious analyzed and critiqued this video more thoroughly than I. Racialicious suggests that this insensitivity appears in Florence + The Machine’s video for “The Dog Days are Over” — another example that the band exhibits ignorance in their lyrics and videos. Change.org hoped to collect 2,500 signatures to demand an apology for “No Light, No Light” but only reached 902. I think continuing the discussion about the video and the band will inform more than a petition or apology. In any case, it remains important for viewers / listeners / consumers of pop culture to consider intentional or unwitting messages in their media. As producers of popular media Florence Welch and her band take poetic license into the realm of ignorance and insensitivity toward diversity and violence. Perhaps they should join this conversation.